Mid december, Kinepolis opened it’s first two 4DX theatres in Belgium: one in Kinepolis Antwerp and one in Kinepolis Brussels. 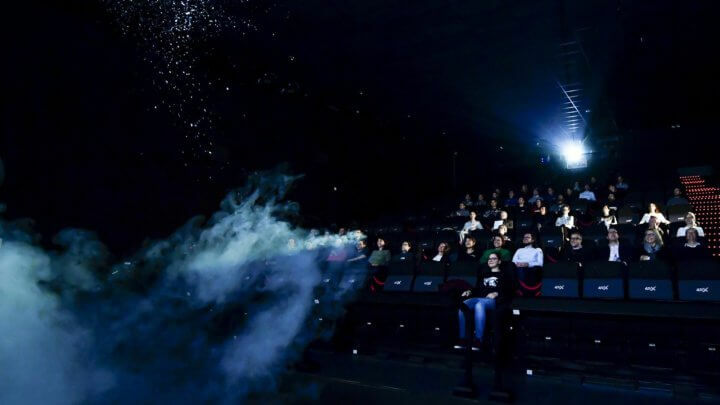 This unique 4DX experience offers the most submersive cinema experience of yet, where viewers are an active part of the film: chairs that move during action scenes, rain that drips down from the ceiling in sync with the weather on screen, gusts of wind, fog, subtle smells and -if you’re lucky!- even snow. For its first 4DX screening, Kinepolis collaborated with Disney for the 4DX première of the newest Star Wars-film. Last autumn, Walkie Talkie supported Kinepolis’ press office with a press release announcing the opening of both 4DX theaters later that year. The result? A wave of press clippings expressing their excitement over the newest technology. In december Kinepolis and Walkie Talkie organized an exclusive press conference at Kinepolis Brussels for both Dutch- and French speaking press, inviting key national media and film critics for a short 4DX demonstration, a Q&A with Kinepolis’ marketing managers and an optional 4DX screening of Star Wars: The Last Jedi. Later that evening, Walkie Talkie and Kinepolis also hosted a seperate influencer screening. We invited 25 influencers and their guests for an intimate reception followed by the 4DX screening of Star Wars. The aim was to generate as much buzz as possible surrounding Kinepolis’ 4DX launch, not only in press but also on social media. Therefore we focussed on a well-considered mix of lifestyle influencers with a strong reach on social media and die-hard Star Wars fans that write for their own film blog. Curious? See a little recap of the 4DX influencer opening right here.